I'll be honest, I'm no Shakespeare when it comes to wrenching on my Airsoft guns. Wait...What? Well, what I mean is, I've made some bad choices in the past when attempting to repair, tune, and/or otherwise "improve" the performance of the various Airsoft guns I've owned over the years. My biggest "tragic flaw" when it comes to working on my guns has been not having the right tool for the task I was attempting to accomplish. So...today, I thought I might give you a brief tip or two on a tool that I have found to not only get the job done right, but often times, they have made my life as a non-professional (as opposed to "unprofessional") Airsoft tech SUBSTANTIALLY easier as a sort of bi-product. 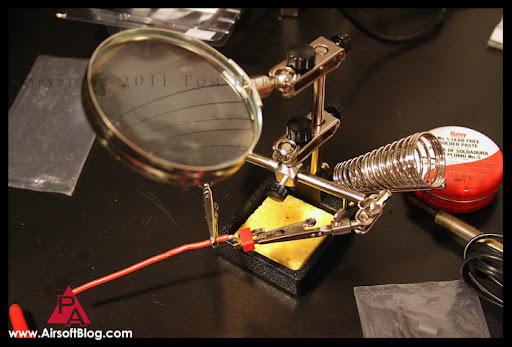 Soldering a connection between two items, like the one above, generally requires two sets of hands (one set equals two hands), for a total of four hands. One hand to hold the wire in place. A second hand to hold the connector securely in place, touching the wire. A third hand to holder the solder (the stuff that you're melting the two pieces together with) and of course, the fourth hand to hold your your heat source, which is generally going to be a soldering iron. Obviously, humans having only two hands to work with are at a disadvantage when it comes to this procedure, thus, the contraption I'm discussing today was born. The icing on the cake here is the magnifying glass. 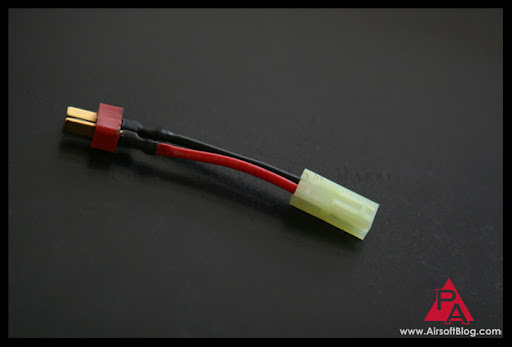 While not a necessity, certainly enhances the convenience factor for viewing what you're doing when soldering small connections like an AEG wire to a Deans connector. While not the absolute cleanest soldering job out there, compared to what my old Tamiya-to-Deans adapters look like, this is a substantial improvement. 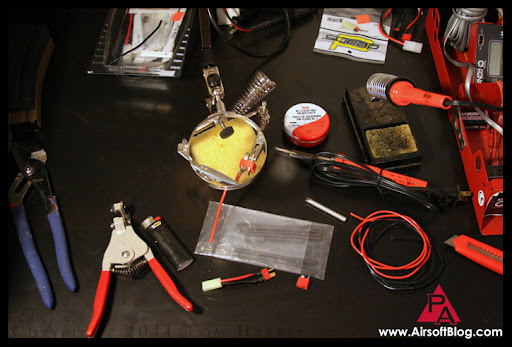 In the past, I've had to use a ton of solder and a lot of shrink tube plus electrical tape because somewhere in the equation, I didn't have the right tools for what I was doing. The helping hands tool is just one example of really helpful tool that doesn't cost very much to acquire (around $17 plus tax for the one I got) but gives you a huge value in terms of making it easier to modify or upgrade your AEG the right way. 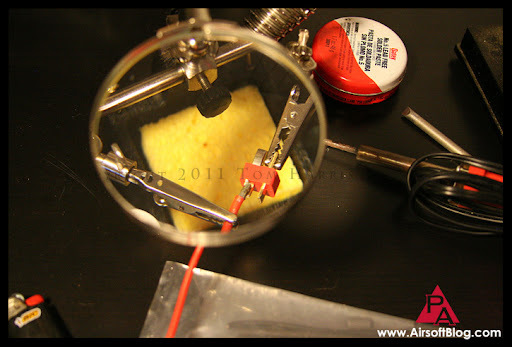 There are a multitude of other super-handy tools out there that can make your life a lot easier when tinkering around with your Airsoft guns and I will probably mention a few more key items at some point as well. If you were wondering about what tool would be best to accomplish a certain task on your Airsoft guns, just ask. I might know the answer. But I might not. I make no promises. I still love you though. If you're starving for more Airsoft AEG mods & maintenance tips than what I've provided you thus far on the Pyramyd Airsoft Blog, hop on over to the Pyramyd Airsoft YouTube Channel and check out some pretty informative videos from the Rapid Fire Review guys. Here is their latest video on some basic maintenance & upkeep tips to help you keep your arsenal in tip-top shape. Regarding the segment on cleaning inner barrels, viewers of the video above should note that for the most thorough and effective cleaning, you'll want to take your inner barrel completely out of the your gun (whether it be a rifle or pistol) and take down everything necessary to get the inner barrel by itself (with no hop-up bucking attached). While I've certainly cleaned my barrels like they've done it in the video when I was in a hurry, you could potentially end up just pushing dirt and debris farther back into the barrel or even into the hop-up or air nozzle of your gearbox if you don't know what you're doing. Aside from the inner barrel itself, the hop-up and/or air nozzle are two places that you absolutely do not want ANY dirt or debris. Thus the basis for my view that the best way to clean the inner barrel is to take it completely out of the gun and remove the hop-up bucking prior to cleaning. Their actual technique for cleaning using the cleaning rod and cloth are spot-on, as far as I'm concerned. Repeat until you pull out a clean paper towel.